With Bruno Mars now claiming the second spot and Monster Jam (just barely) at the very bottom, the two-month dominance of the monster truck show is over. 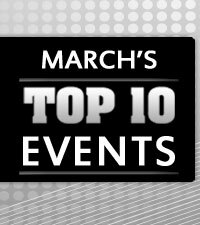 Although the events are still doing quite well — enough to earn it a place in March’s Top 10 — it lost its lofty position thanks in part to the passing of a popular event in Dallas, TX, at the end of February. In its place is the other family-friendly and affordable show, Ringling Bros. and Barnum and Bailey Circus. Mars, meanwhile, is in the Top for the first time since we started the series last year. Rounding out the first five is P!nk, who returns after briefly being there last October, and Taylor Swift, who returns to the first five after falling to the second half in February. And, currently in the second half we see Justin Timberlake and Jay-Z’s tour, which enters the list for the first time, while George Strait is back after a month off, and the Dave Matthews Band returns for the first time since last June. * Rankings are as of 4/3/2013 4:00 p.m. EDT. Top 10 list is ranked based by the number of tickets sold on TicketNetwork.com. The number of onsales this week is fairly light, with the exception of P!nk. P!nk has 11 more onsales Friday and Saturday, for cites including Boston, MA; Louisville, KY; and Orlando, FL. Lady Gaga has onsales this Friday for Atlanta, GA; St. Louis, MO; Saint Paul, MN; Nashville, TN; and Phoenix, AZ. Mannheim Steamroller has a couple onsales for its annual holiday tour: one on Friday for Birmingham, AL, and one on Monday for Daytona Beach, FL.